The Gaggenau brand is a praised, high-performance brand with a record of innovation and excellent design. Started in 1683 as a German foundry, Gaggenau was eventually bought by an excellent home cook and the rest is history. As the winner of multiple IF Design Awards, Gaggenau appliances are built with a powerful presentation along with high-performance engineering. Even with so much praise, Gaggenau appliances may still break or need repair of some kind. Instead of calling up a generic service center, contact Action Appliance Repair for expert service. As a family-owned and operated business since 1961, the Action Appliance Repair technicians are experts at what they do. Our customers return time and time again for our knowledgeable staff, excellent customer care, and unbeatable service for specific brands. Many service centers offer a general knowledge about appliances. At Action Appliance Repair, we have over 50 years of experience with high-performance brands such as Gaggenau. When you need your Gaggenau appliance repaired then make sure to call us toll free at 866-611-4479. We make sure you get the best price and service in town. Your service call is free with each repair we make. While your Gaggenau appliance is built to last, sometimes machines break. 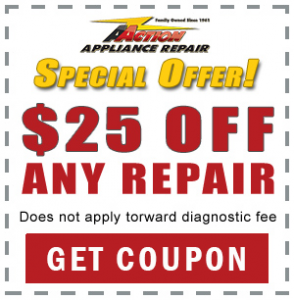 Make sure to call Action Appliance Repair for quality service. You can be sure that you appliance is in expert hands with our service center. We are proud to provide our customers with professional repair, trusted technicians, and a 5 year pro-rated parts warranty. So what does calling Action Appliance Repair for your Gaggenau appliance mean for you? We waive the fee of our service call if we repair your Gaggenau appliance. You won’t owe us anything if we visit and are able to repair your appliance.